To explore the potential of two kelps as natural sources of bioactive compounds, this study evaluated total phenolic content, antioxidant properties, anti-inflammatory, and cell viability activities of polyphenol-enriched fractions from Eisenia arborea and Macrocystis pyrifera. Overall, the fractions from E. arborea had higher antioxidant properties than M. pyrifera. However, two fractions from E. arborea and M. pyrifera showed the strongest antioxidant activities among 12 fractions tested by polyphenol content, 1,1-diphenyl-2-picryl-hydrazyl (DPPH), and Ferric reducing antioxidant power (FRAP) assays. Several fractions upregulated IL-10 gene expression and downregulated TNF-α and iNOS mRNA in RAW 264.7 cells. Remarkably, most of the fractions at the highest concentration (1280 μg mL−1) showed non-toxic effect on L9S29 cell line. Analysis of fractions by Fourier transformed infrared from attenuated total reflectance (FTIR-ATR) and by ultra-performance liquid chromatography coupled to electrospray ionization quadrupole time of flight mass spectrometry (UPLC-ESI-Q-TOF-MS) suggested the presence of phlorotannins, such as phloroeckol, fucophloroethol, and phlorofucofuroeckol. 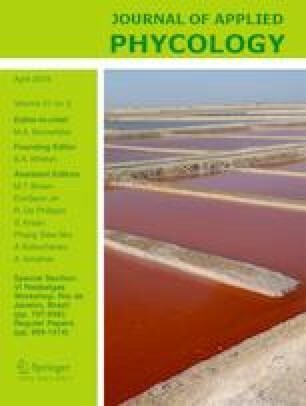 In conclusion, the polyphenol content (phlorotannins) varied among fractions of macroalgal species and influencing their biological properties, which represent natural sources for health promotion. The authors are grateful for the financial support by CONACYT Mexico (INFR-2014-01/225924 and PDCPN2014-01/248033). P.A.T.R. is a recipient of a study fellowship (CONACYT); to D. Fischer for editorial services in English.